Checking in on my new hobby, budget wise. Wanted to share. VDH Soap also works well but alas the scent will relegate it to emergency or mix-in use only now that I have better things. My first DE, a beautiful TTO with good heft. Love it. No problems. Bought this soon after, for me its even better than the 99R, but thats the fiddly engineer inside me loving the ability to adjust the blade. My every day shave now. will take me a long time to work through all these. No losers yet but only noticing variability in # of good shaves. Both of these work very well, like the Sandalwood best. Fantastic stuff. 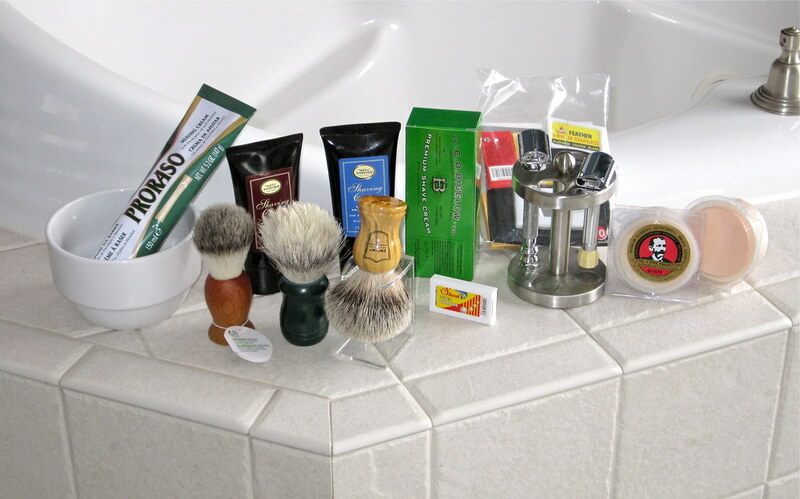 Great shaves, I like the smell. snagged in an airport as travel option, have not used yet. My first badger. Its far superior to the boar for me, lathering machine, love it. Wish it was slightly stiffer. Wow. Thats… so… not bad! compared to my past hobbies!! Now to be sure its frivolous and a lot of money, but what a fun way to get a lot of stuff (most of it was acquired via Christmas gift money.) I shudder to think about watches and knives Acquisition Disorders in the past.